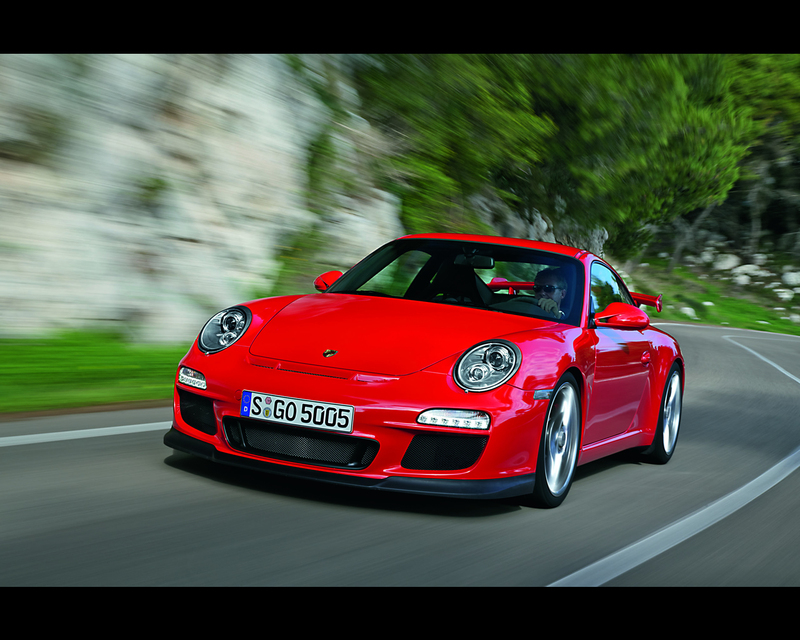 Porsche is introducing the 2009 Porsche GT3( red car in the pictures) at 2009 Geneva Motor Show and Europe sales are starting in May. 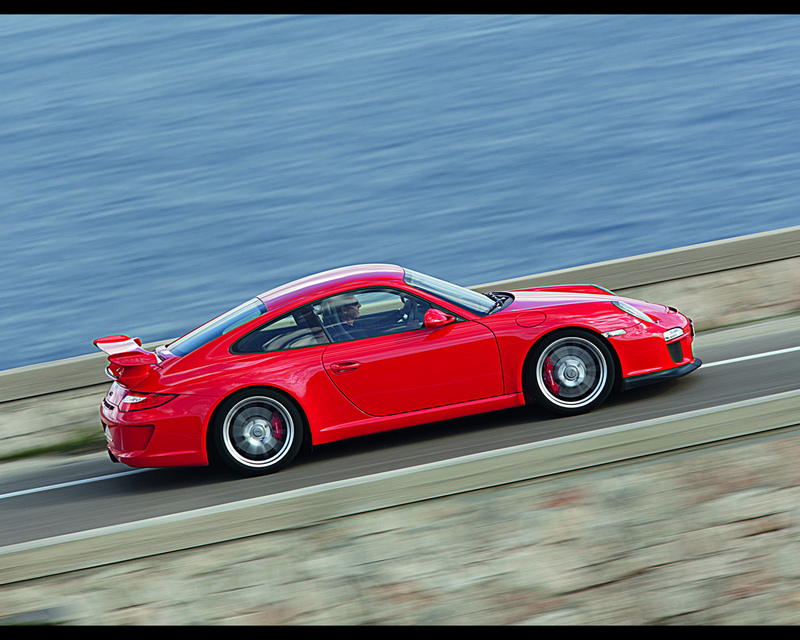 The GT3 is defined as the most sporting and dynamic road-going 911 with a naturally-aspirated power unit. Now the proven six cylinder power unit develops a maximum output of 435 hp (320 kW), up 20 hp over its predecessor. This results from an increase in engine capacity by 200 cc. to 3,8 litres and from an improved gas cycle: now not only the intake, but fro the first time also the exhaust camshafts are adjusted by VarioCam. The boxer engine also offer a significant increase in torque at medium engine speeds. The new GT3 is claimed to accelerate from a standstill to 100 kph (62 mph) in 4,1 seconds and reaching 160 kph (100 mph) in 8,2 seconds. Top speed is announced for 312 kph or 194 mph. For the first time the Porsche GT3 comes with a particularly sporting variant of PSM Porsche Stability Management, offering the option to desactivate both Stability Control (SC) and Traction Control (TC) in separate steps. And to give the driver unrestricted, individual control over the driving dynamics of his car, these functions are not reactivated automatically even under the most extreme driving conditions, but only at the touch of a button. The new Aerodynamics Package gives the GT3 a brand new look further accentuated by the new bi-xenon headlights, LED rear light clusters as well as modified air intakes and outlets. Specific modifications of the car's aerodynamics are increasing down-forces both front and rear to such an extent that the overall pressure pushing down the car is more than twice as great as on the former model. 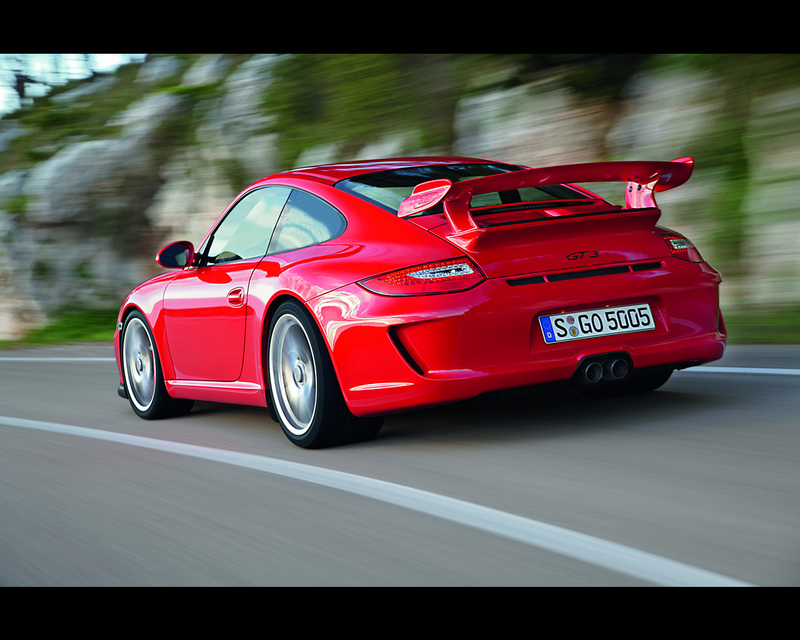 Another feature also new on the 2009 GT3 is the optional lift system for the front axle able to raise the ground clearance of the car for driving on bumpy surfaces or steep gradients - for example into an underground garage - at the touch of a button by 30 mm or almost 1.2". 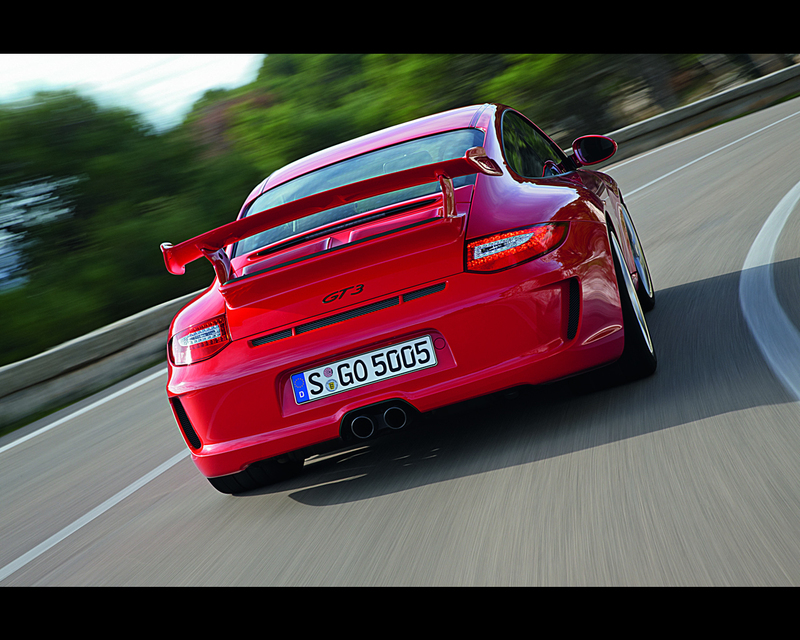 The Euro base price of the new Porsche GT3 is Euro 98.100. 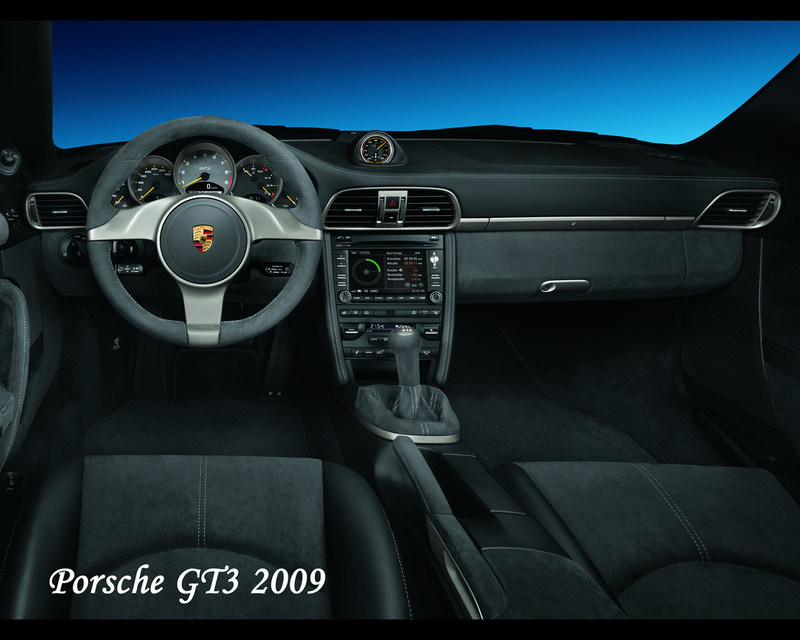 In the USA the GT3 will be at the dealership in October at a price of USD 112.200 (MSRP without taxes. The successful Porsche 911 GT3 RSR ( white car in the pictures) takes off into the new model year with extensive modifications. The most powerful race car based on the Porsche 911, which last season secured wins in the American Le Mans Series and at Nurburgring 24 Hours, competes in the GT2 Class at international long distance races. The most distinguishing feature of the new GT3 RSR is the redesigned front with large air outlets on the front hood. Under the lightweight bodyshell, as well, major changes were made. Noticable at first sight are the air outlet slots, or the so-called louvers, on the front hood: an indication of the completely redesigned air ducting of the radiators, which became necessary through the new design of the supply and discharge air with the installation of an optional air-conditioning unit. The aerodynamics under the rear underwent further optimisation. The rear wing now features a wider adjustment range. The monocoque body (basis GT3 RSR is made of hot-galvanised steel. There is a welded in safety cage. The bucket type racing seat on the driver side only comes with flame-resistant seat cover and six-point seat belt adapted for the use of the HANS Head and Neck Support. The capacity of the well-known six-cylinder boxer engine is increased from 3,8 to 4,0 litres. After another reduction in the size of the air restrictors for the 2009 season, the engine now delivers around 450 hp (331 kW) at 7.800 rpm and develops a maximum torque of 430 Nm at 7.250 rpm. The rev limiter kicks in at 9.400 rpm. Transmission is by six-speed gearbox with sequential jaw-type shift and three-plate carbon fibre clutch. In the cockpit, a new multi-function display located above the dashboard indicates the optimum moment to change gears. Another new feature is the programmable multi-function, onboard supply system control device, giving teams the choice of many individual functions. 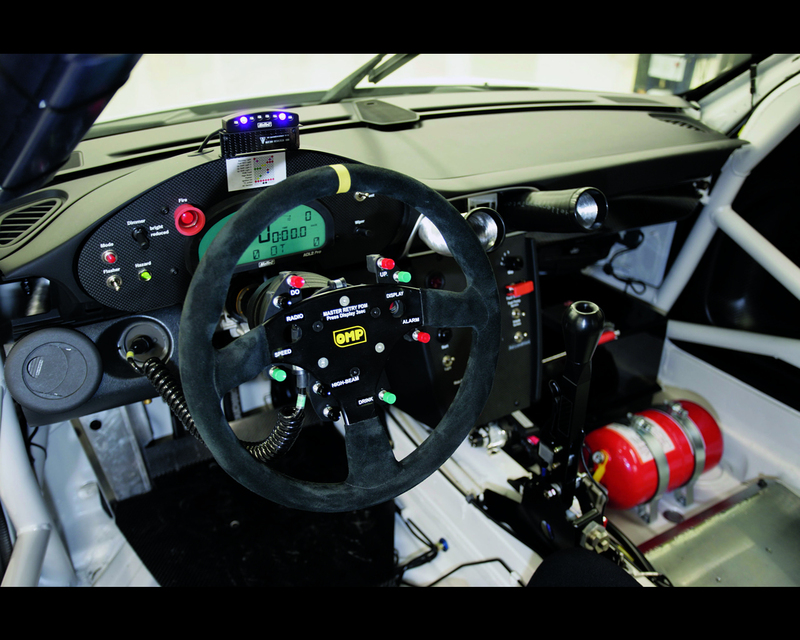 The Porsche GT3 RSR now features a new air-jack system with overpressure valve. Aside from GT3 Cup and the GT3 Cup S, the GT3 RSR is the third race car based on the Porsche 911 offered by Porsche Motorsport. About 20 Porsche 911 GT3 RSR racers have been built in Weissach and are now being delivered to customer teams around the world. 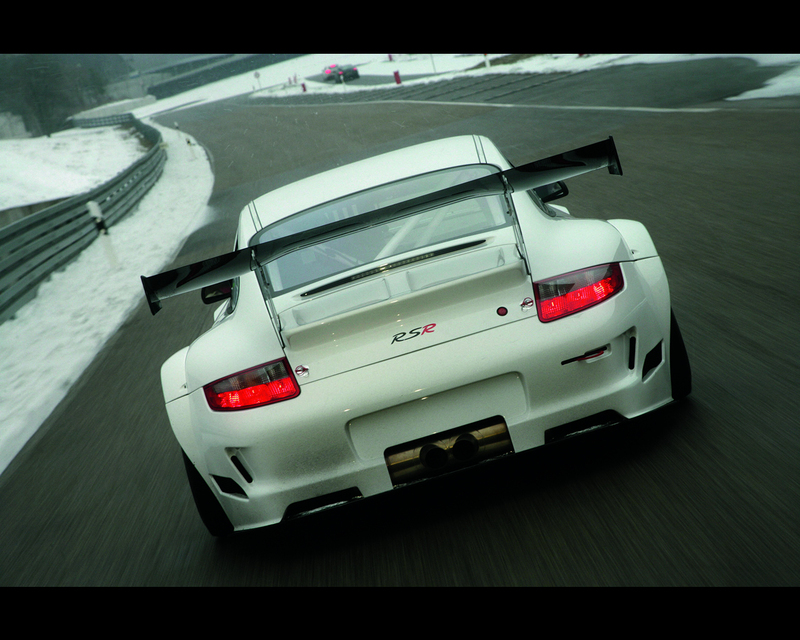 The GT3 RSR costs Euro 380.000 plus VAT specific to each country.